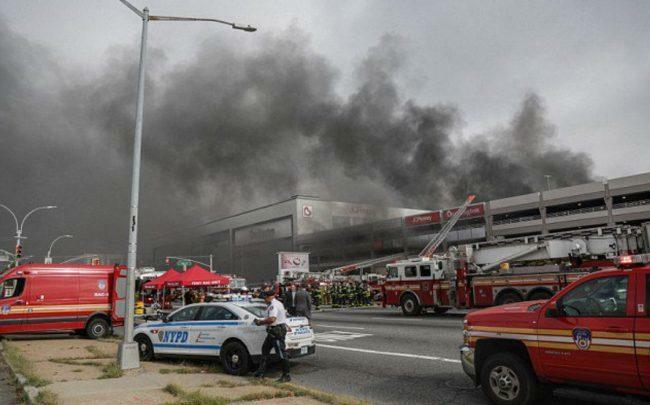 UPDATED, 9:56 a.m., Sept. 18: A seven-alarm fire engulfed a parking garage at Macerich‘s Kings Plaza Shopping Center in Brooklyn on Monday morning, leaving almost two dozen people hurt. A call on the fire in the garage at Avenue U and Flatbush Avenue came in just before 9 a.m. on Monday, and the fire had become a seven-alarm inferno by 11:15 a.m., according to NBC. By noon, firefighters had the blaze under control. A total of 21 people — including 18 firefighters — were hurt in the blaze, but none of the injuries were life threatening, and the garage is not in danger of collapsing, according to NBC. More than 100 vehicles caught fire, and police have arrested 23-year-old suspect Avon Stephens for arson. His possible motive is unclear. The plaza has been closed, although the fire did not spread to any stores. There are more than 120 stores in Kings Plaza Shopping Center, and Burlington Coat Factory signed a 55,000-square-foot lease for the building at the end of last year.